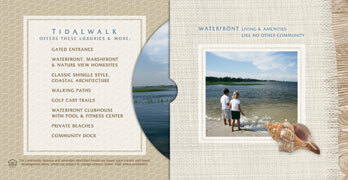 Pre-construction, the seaside community of Tidalwalk wanted a promotional DVD that they could distribute to interested builders and brokers. The DVD project started with an on-site photo shoot. I then collaborated with the client and a small creative team to develop storyboard sketches and a script for the video. I designed the DVD package and partnered with a local vendor to produce the DVD. The result was a relaxing three-minute presentation of the images accompanied by soft music and a voice over. The DVD gave viewers a taste of the lifestyle soon to be found at Tidalwalk. The developer unveiled the community concept at an event by showing the video. After the premiere, the DVD was in such demand that we had to order additional copies to fulfill the requests.